If it does all those for the MKV files you’re using, you are good to go. If not, you will need to re-configure & (likely) recompress. In addition, if the source 3D MKV’s resolution is too big, normal 3D TVs including Samsung Active 3D UE55H6400 TV perhaps can’t handle. Simple as that. Most hardware decoders on 3D TVs have similar HD limitations (usu. due to economizing). Put it easier, if you want to play 3D MKV files on your Samsung Active 3D UE55H6400, make your 3D MKV files in 1-6 your 3D TV supports. To solve the original question here, you can resize 3D MKV files to 1920×1080 (squeezed, HSBS) for Samsung Active 3D UE55H6400 TV. Half SBS must do the trick, but if you think you have an active 3D TV and would like to watch in Full HD (and not half the resolution). You can try Full SBS (aka 1920×2160). Those dimensions might still be within the decoders’ limitations of Samsung Active 3D UE55H6400 TV (depends on which profile/levels are supported). This way may make you play a Full HD (1920*1080 for both eyes) 3D movie with the internal TV media player on Samsung Active 3D UE55H6400 TV. – Easily create 3D movies for top 3D TVs including Samsung UE55H6400 3D TV from 2D/3D Blu-ray/DVD with abundant 3D effects: Side by Side, Anaglyph, Top/Bottom. – Convert 3D ISO, 3D MTS, 3D MOV, 3D WMV, 3D MKV to Samsung LED F6400 Series, Samsung LED F8000 Series, Samsung LED F7500 Series, Samsung LED F7100 Series 3D Smart TV and LG 3D TV, Sony 3D TV, Panasonic 3D TV, etc. – The 3D Depth of output 3D movies could be adjusted from 20 to 100 for more vivid 3D effect. – It can help you freely convert between different 3D modes, such as convert between Side by Side (Half-Width/Full), Top and Bottom (Half-Height/Full) and Anaglyph. – Allows you to choose video codec from H.264, H.265, DivX, XviD, MPEG choices and adjust output video resolution to 3840*2160, 3840*1080, 1920*2160, 1920*1080, 1920*720, 960*540, etc. – Enables you to choose audio codec to AAC, AC3, MP3, DTS, etc and audio channel to stereo, mono, surround 5.1 channel, 7.1 channel. How to Make 3D MKV Playable on Samsung Active 3D UE55H6400? Click “File” > “Add Video” to load your 3D MKV files to the app. Or you can simply drag and drop the 3D MKV files to the 3D MKV to Samsung 3D TV converer. 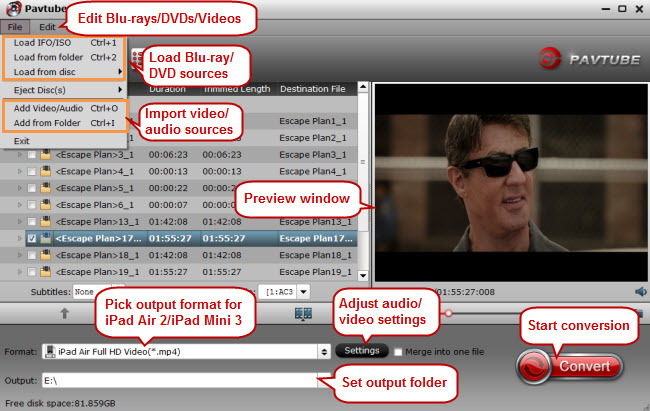 Batch conversion is supported by the 3D MKV converter. Navigate to “Format” > “3D Video” > “MKV Side-by-Side 3D Video (*.mkv)” or “MP4 Side-by-Side 3D Video (*.mp4)” for Samsung UEH6400 3D TV. Press on “Settings” icon to open a new window. Here, you can adjust 3D depth, 3D mode, video resolution, video bitrate, video codec, audio codec, audio channel, audio bitrate, etc. If you want to test 3D MKV in 1920*2160 on your Samsung Active 3D UE55H6400, just tap 1920*2160 in “Size” box. Otherwise, just choose 1920*1080 3D MKV which can be played on Samsung Active 3D UE55H6400. Make sure your audio codec is AAC or AC3. 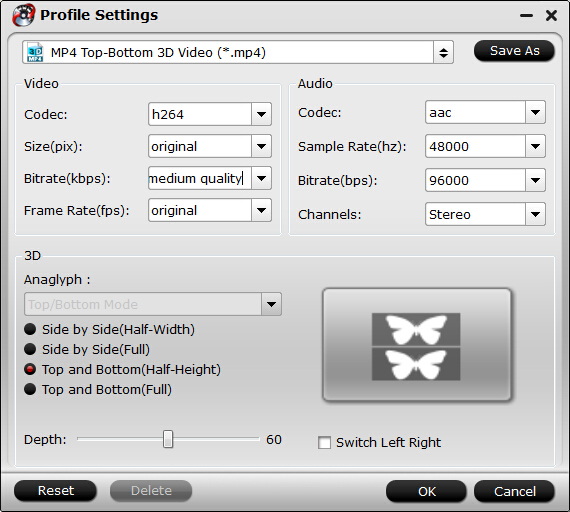 Finally, click on right-bottom “Convert” button to start to convert 3D MKV to 3D MP4 or 3D MVK with suitable resolution for Samsung Active 3D UE55H6400. 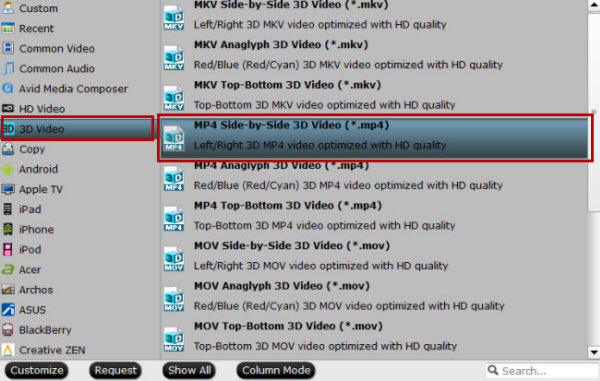 After the process, open the output folder to locate the genetated 3D MKV/MP4 video. 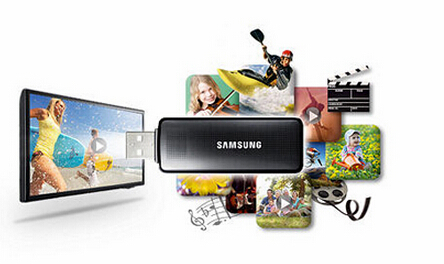 Put the 3D MKV/MP4 file to an external USB hard drive then connect with your Samsung Active 3D UE55H6400 smart tv. The 3D MKV/MP4 video should be played on Samsung Active 3D UE55H6400 smart tv successfully. If you still can’t play your 3D MKV on Samsung Active 3D UE55H6400 smart tv, just e-mail us at dvdwinsupport@pavtube.com.